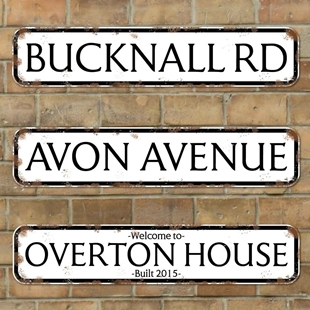 Personalised traditional style pub lantern. 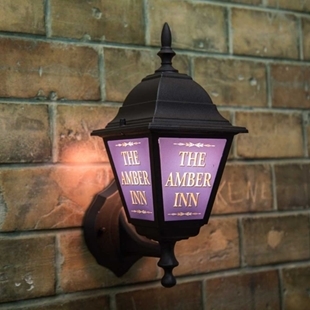 4 sided traditional style wall lantern with a pint logo, personalised with any text you like. BESPOKE ITEMS UNFORTUNATELY CANNOT BE REFUNDED. PLEASE ENSURE THAT YOU CHECK ALL DETAILS ARE CORRECT BEFORE PLACING THE ORDER. A substantial 4 sided lantern in black aluminium metal with glass sides. This traditional style lantern is for outdoor use. 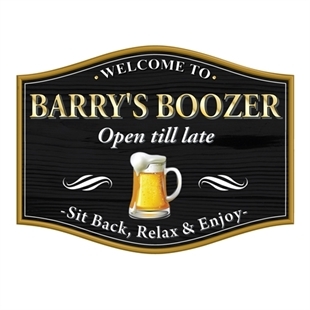 This barrel shaped set of 4 Beer Mat coasters can be personalised with an text you like. Vintage style metal composite street sign wih an old rusty effect. 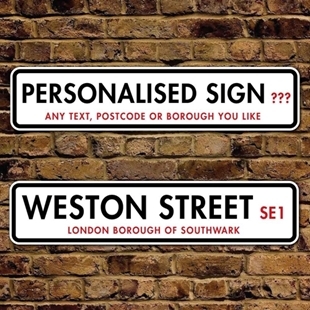 SP-00012 - Personalised english pub sign with a choice of colours and sizes.